Before I get into the good day for the NL Central, though, it's time to point out that my adopted-for-this-postseason Vancouver Canucks moved into the Stanley Cup finals last night in dramatic fashion. I watched all of the first three periods, but fell asleep before overtime started, so I missed the winning goal and didn't see if they touched the Campbell Bowl or not. * In any case, good to see a Canadian team back in the finals. Plus, any excuse to post maybe the worst jerseys off all-time, maybe in any sport, is a plus. 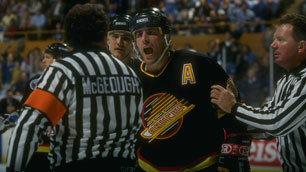 ** That said, the Canucks actually wore these downright respectful jerseys in the 1994 finals (relatively speaking). *Some Wikipedia editor (presumably from Vancouver) is ON IT. Also, upon further review, they didn't. **Special thanks to my cube-neighbor Jonathan Mayer for finding this picture. The much-maligned* Roberto Luongo played out of his head for most of the game. Based on the first period, I really thought the Sharks would get shut out. Vancouver scored on a pretty slick goal early in the game, and I really thought that might be all the scoring we would see. But, Luongo let a sort-of soft one in on a power play, and then made a pretty bone-headed decision in the third period to put the game in jeopardy. Thankfully for Canada, the Canucks battled back and forced OT with just 13 seconds remaining on the clock, ending regulation on one of the best games of this postseason. It should also be noted that Ryan Kesler, the goal scorer, hobbled off the ice earlier in the game and was a real question mark if he would return at all. Unfortunately, as I noted earlier, I fell asleep at this point, so I didn't get to see this odd goal to clinch the conference, or all the traditions that go along with it. Oh well. Maybe I'll be able to make it all the way through Boston and Tampa this evening, assuming Boston wins (a big assumption).. In baseball news, the Cubs actually blew somebody out! True, that somebody was the Mets, which you may have heard are kind of a mess these days. But, I'm not going to be the one to talk bad about an 11-1 win. In fact, the whole NL Central had a pretty good day. In addition to the Cubs, the Cards won 3-2 (in extras), the Reds won 6-3, and the Brewers won 7-6. The two losers, Pittsburgh and Houston, lost by a combined three runs. Not a bad day at all. Plus, there was a Reed Johnson sighting in center field yesterday. Now, I like Marlon Byrd, but Reed might be my favorite current Cub. And he made a sweet diving catch while I was flipped over to the baseball game between periods. This is probably going to turn into AP Hockey for the next couple weeks, so just be prepared. It'll be full-time baseball after that, though. Until then, enjoy Johnny Canuck. He play with no real helmet or pads, but don't take his gloves away. That's a pretty rough-hewn stick, and Johnny Canuck does not do splinters.